This article is about vintage military aircraft. For the comic book superhero, see Carol Danvers. A warbird is any vintage military aircraft now operated by civilian organizations and individuals or, in some instances, by historic arms of military forces, such as the Battle of Britain Memorial Flight, the RAAF Museum Historic Flight or the South African Air Force Museum Historic Flight. Restored warbirds are a frequent attraction at airshows. Highly modified as well as "stock" warbirds can also frequently be seen at air races, since World War II-era fighters are among the fastest propeller-driven airplanes ever built. Some of the most popular warbirds for races are the North American P-51 Mustang, the Hawker Sea Fury, the Grumman F8F Bearcat and the North American T-6 Texan. Although the term originally implied piston-driven aircraft from the World War II era, it is now often extended to include all airworthy former military aircraft, including jet-powered aircraft. Vintage jet aircraft in airworthy condition, however, are much rarer due to technical complexity. Sometimes, modern production aircraft such as Allison V-1710-powered Yakovlev Yak-9s from Yakovlev and replicas and reproductions of vintage aircraft are called "warbirds", such as Messerschmitt Me 262s built by the Me 262 Project and Focke-Wulf Fw 190s by Flug + Werk; this can include any one of a large number of different aircraft designs from between World War I and the late 1930s, when military aircraft design was less complex. Such replicated warbirds may even be powered by vintage engines from the era of the aircraft design being flown, as Cole Palen and others associated with his institution did at Palen's Old Rhinebeck Aerodrome aviation museum with accurate and airworthy reproductions of the Fokker Dr.I, Fokker D.VII, Fokker D.VIII, Sopwith Camel and Sopwith Dolphin World War I aircraft. There are several different types of warbirds such as the fighter, trainer, bomber, jet, transports, utility, etc. Examples of aircraft types include the North American P-51 Mustang, Vought F4U Corsair, Boeing B-17 Flying Fortress, North American T-6 Texan, Beechcraft T-34 Mentor, Messerschmitt Bf 109, Hawker Hurricane and Supermarine Spitfire. In Europe, one of the best known warbird air show is the annual Flying Legends arranged in Imperial War Museum Duxford in UK. La Ferté-Alais air show in France collects warbirds annually too. Warbirds fly also in most of the Shuttleworth Collection flying days in UK every summer. Experimental Aircraft Association (EAA). The primary focus of the group started with building individual airplanes, and it soon grew to include antiques, classics, warbirds, aerobatic aircraft, ultralights, helicopters and contemporary manufactured aircraft. Warbirds of America (WOA) is a non-profit organization formed in 1964. A year after its start, it became a branch of the EAA. ^ Spick, Mike. 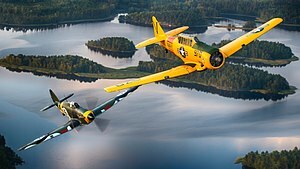 Classic Warplanes. New York: Smithmark, 1991. ISBN 0-86101-622-X. 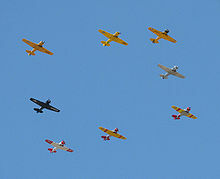 Wikimedia Commons has media related to Warbirds.